Protesters calling for pay of $15 an hour and a union march toward McDonald's headquarters in Oak Brook, Ill., Wednesday, May 20, 2015. Protesters rallied outside a McDonald's for higher wages, and the company says employees at its headquarters were working from home Wednesday ahead of more planned demonstrations tied to its annual shareholders' meeting. The world's biggest burger chain also told employees to work from home last year, when protesters calling for pay of $15 an hour and a union gathered outside its buildings. 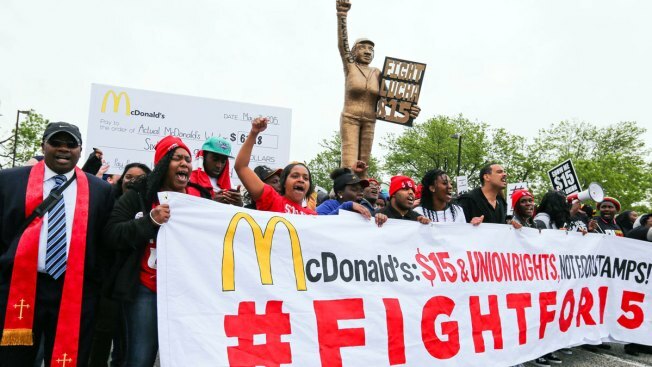 This year, the protests began Wednesday with a strike at the Rock N Roll McDonald's in Chicago. Organizers say thousands are expected to demonstrate at the company's headquarters in suburban Oak Brook on Wednesday evening, and set up tents overnight until the shareholders' meeting Thursday. "Employees were strongly encouraged to work from home and the majority of them are taking advantage of the opportunity," said Lisa McComb, a McDonald's spokeswoman. In the first quarter, McDonald's reported $1.1 billion in profits on sales of $5.9 billion.